It's Hop Time once again! We are truly hucky to have snagged Orly Avineri as a StencilGirl Stencil Artist! She is really one-of-a-kind awesome! Very Free Form . This could be interpreted so many ways. I was fascinated by this face ...or what I took as a face anyways! I started by making my background. and left overnight for thorough drying. Then I started playing with Neocolor II Crayons and markers and pens. and I was tempted to do the same thing here. I played with the faces part of the stencil on several of my journal pages. So much variation in each one! I finished these six...and have several more started! and I only touched the surface! Go visit all the Hop Artists playing along! Only you Janet could get so many different looks from one stencil! When I saw that one with the caffeine it put a HUGE smile on my face! Awesome inspiration! Love all your faces! It's amazing how different you can make them look using the same Orly Avineri stencil! Love the way you let your imagination run wild with these!! Got a big smile when I saw the caffeinated image! :) Awesome! Your work in transforming the basic image into various expressions and intentions is stunning. Love all the variations! Each evokes such individual feelings! Love your faces and to see how differently you have used the stencils. Thanks for the chance to win one of Orly's stencils! Wow, so many different characters from one face, loved it! Another TOTALLY different technique of using the stencils! Love that. I'd LOVE to win 1 of Orly's stencils & want to try the different techniques I've viewed today. What FUN faces Janet! I wonder what my face looks like after caffeine! lol!! love your interpretation with the new stencils by Orly. These are fun, Janet. It's the queen of the fairies. Fun use of stencils for faces! Oh wow... I had this same stencil, but I love how you took this in such a different direction! I never would have thought to use it as the basis for faces. Awesome! What fun! And yes, great many uses for one stencil! Love your doodling. Every face is great. Such fun to be able to do so many things with one stencil. Thanks for sharing. Creative use of the stencil for all those faces...and great texture too! Looks like both Carolyn Dube and you worked with the same stencil with very different results. I just love how artists can take very similar materials and put their own, very personal spin on things. Such creative fun!!! I love your pages and how your pages are so different than the others that used the same stencils…we are each so individual! I love your post! The caffeine one gave me the giggles, I so relate! So many variations on this one part of the stencil. Love this hop and these stencils! Thank you so much! Sorry, I meant to say: So cool to see so many variations with ONE stencil! You sure did a lot of work with this stencil. Way to go! Love your texture and all the unique faces. This is very interesting! You are very creative! Thanks for sharing your process! 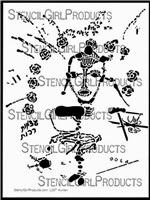 Love these new Stencil Girl stencils. I can't wait to play! Versatile stencil and very talented artist! Love how many faces you created and how different each one became! We are lucky to have Orly's great stencils and I am thankful we have you as one of StencilGirl's design team! Very cool stencil and I love how you used it. Thanks for sharing! So not your usual style. Looks like you had a lot of fun playing outside the box with it! I love these new stencils! Congratulations Orly! How fun. Thanks for showing us how versatile this stencil is. Loving all your textures and layers, too. cool faces, tfs!! love the stencils! wonderful faces and use of roses from the stencil. Great color combos and texture! Been jumping around this blog hop and these stencils certainly have my creative juices flowing. Amazing how different all the various artists styles are and what they have done with them. Way to go Orly! Can't wait to get these. Love your piece - I'm on for the caffeine. Thanks for a chance to win. What a great stencil - all your faces are so different !! How much fun! Love what Orly's new stencils add to the Stencil Girl line...Fabulous! Love Orly's new stencils and seeing what each artist is creating with them! Thank you! Fabulous faces! Orly's stencils are just great. Very cool! Love all the different variations of faces you tried! Great job. Thanks for sharing. All the faces you created are wonderful!! Beautiful pages! Love what you did with Orly's stencil. Beautiful faces and pages. Ooh my gosh, what a wonderful array of faces from one stencil. Great ideas and colours. Thank you for sharing so many variations. So much fun! You really let yourself play and that is fantastic! It looks like you had a blast playing with the stencils! Thanks for the chance to win one! These are great! Love all the texture! I really enjoyed your use of these stencils. Your pages made me smile. I love all the stencils from Orly. They are so unique.